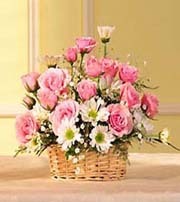 Basket arrangement with 12 pink roses, pink mini carnations, and hot pink carnations is complemented by some white seasonal flower. Designed in a handled basket. 100% satisfaction guarantee. If you are not satisfied with our service for any reason feel free to contact us. We will redeliver a new product. The choice is yours! Problems are rare, but when they occur ,flowerdeliverycavite is available 24 hours a day to help you. We don\'t promise any time on delivery day. Our commitment is to deliver your gift within the day. We don\'t promise any time on delivery day. Our commitment is to deliver your gift within the day . There is some provincial area where we can\'t deliver on saunday.kindly inquire before you place order. If you place your order after cut off time for Valentine\'s Day delivery, we will still process your order and deliver as fast as possible under queue basis.